Members of the Student Senate met with U.S. Senator Luther Strange of Alabama to discuss leadership. The Princeton Review recently ranked Hampden-Sydney College in the top twenty nationally for Most Active Student Government, and it's easy to see why. Members of the Student Senate visited Washington, D.C. this summer to meet with U.S. Senator Luther Strange of Alabama and discuss leadership in action. 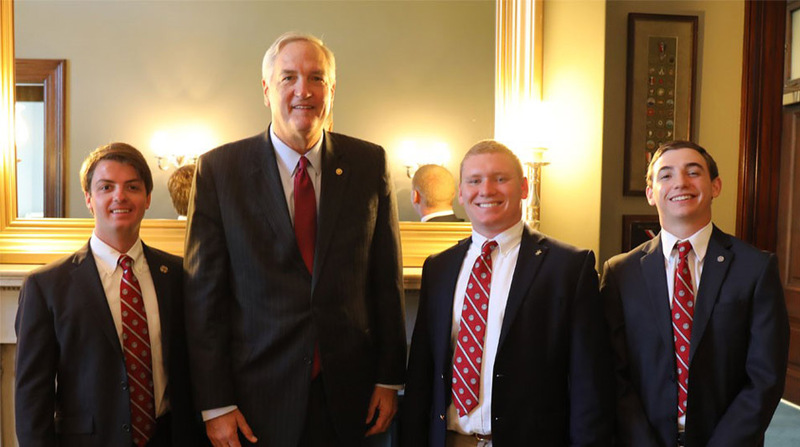 Senator Strange is no stranger to Hampden-Sydney; his chief of staff is Kevin Turner '03. Student Senate Chairman Lucian Bloodworth '18 coordinated the visit with Turner and John March '17, who works in the office of U.S. Congressman Tom Garrett of Virginia. Bloodworth visited Capitol Hill with Larry Pullen '19, Colin Corini '20, and Conner Francis '20. During the meeting on August 1, Senator Strange talked about college life, the demands of representing an entire state with a single vote, perseverance in the face of strong opposition, effective leadership, and the importance of clear communication. Bloodworth says, "Senator Strange told us that the key to every successful leader is to stay true to one's convictions, but always remain cordial in the spirit of fierce debate." The Student Senate is planning additional trips to Capitol Hill this year so more student senators can gain valuable insights from elected officials at the federal level.